Genesis Sonic 3 & Knuckles "Knuckles, 100%" in 44:27.74 by joojamoi & Evil_3D. A Sonic video without Sonic! Instead, Knuckles takes the spotlight and collects all the Chaos (and Super) Emeralds. This run improves upon the previous publication from Evil_3D by 30.23 seconds, thanks to the help of some new glitches and strategies. We also have similar runs with Sonic and Tails, Amy, Knuckles, Tails, Knuckles ring attack, Sonic 100%, Competition mode and Sonic and Tails on NewGame+. 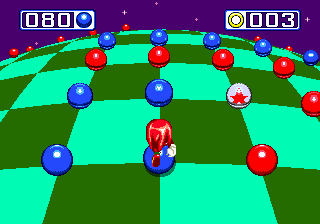 Each second link or sets of encodes use a camhack, in order to have the camera focus on Knuckles while keeping the sprites in the foreground.